This Kreature is was originally created for groundskeeping: as an herbivore that mainly eats grass and aquatic plants, it has an innate desire to chop down trees and foliage with its tail to keep its favourite habitat from becoming overgrown. However, it is also effective in combat, as it is very fast, agile and alert. Its tail blade can absorb energy attacks so it can fling Cutter Waves to chop down its opponents - when not in use, a retractable sheathe-like membrane covers the tail blade to keep it sharp. Its webbed paws also make it an accomplished swimmer. 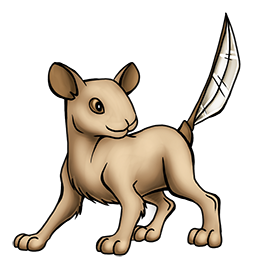 It is well suited for novice Kreature Tamers due to its friendly and playful temperament. It’s a family pet, and home security all in one!